ST. PAUL, Minnesota, January 28, 2011 (ENS) – For the first time, a wild deer in Minnesota has tested positive for chronic wasting disease, which is fatal to deer, elk, and moose but not known to affect humans or cattle. Chronic wasting disease naturally occurs in North American deer, moose and Rocky Mountain elk. It belongs to a group of infectious diseases known as transmissible spongiform encephalopathies that also includes mad cow disease. It is caused by an abnormal protein called a prion which affects the animal’s brain and is invariably fatal. Usually, months to years pass from the time an animal is infected to when it shows signs of the disease. The National Veterinary Services Laboratory in Ames, Iowa confirmed January 25 that a deer killed by a hunter in November near Pine Island in southeastern Minnesota had chronic wasting disease. The finding had been expected and confirms a preliminary diagnosis by the University of Minnesota. Minnesota wildlife officials say the disease is a serious concern, not only because of the obvious harmful effects on deer health, but also due to the negative impacts to landowners, hunters, and businesses. Chronic wasting disease is found in 13 other states, including the Midwestern states of Wisconsin, Illinois, North Dakota and South Dakota, and two Canadian provinces. Typical signs of the disease include drooping head or ears, poor body condition, tremors, stumbling, increased salivation, difficulty swallowing, or excessive thirst or urination. Though it is not known exactly how the disease is transmitted, it is thought to be primarily from animal-to-animal by infectious agents in feces, urine or saliva. 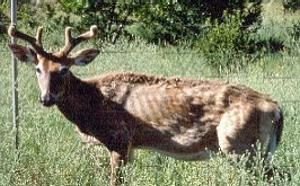 Chronic wasting disease can also persist in the environment and may be contracted from contaminated soil. The movement of live animals is one of the greatest risk factors in spreading the disease to new areas. The Minnesota Department of Natural Resources has been actively on the lookout for chronic wasting disease since 2002, when the disease was first found in a domestic elk farm in central Minnesota. The agency has been conducting surveillance for the disease because wildlife officials say early detection is an important management strategy. Since 2002, said Landwehr, the DNR has tested more than 32,000 hunter-harvested or road-killed deer, 60 elk, and 90 moose as part of this strategy. Until now, laboratory analysis had never found a wild deer “presumed positive” for the disease. DNR big game coordinator Lou Cornicelli will lead the agency’s chronic wasting disease response team. He said the critical first step is to conduct an aerial survey to determine the number and distribution of deer in the Pine Island area. Because this area of the state is almost entirely in private ownership, the second step will be to talk with area landowners to seek their cooperation in collecting additional samples. Cornicelli says the purpose of sampling is to assess disease distribution and also to reduce the potential for the disease to spread. Sample collection could take the form of a late winter deer hunt, landowner shooting permits, or sharpshooting in conjunction with cooperating landowners who provide permission.